We now have an Artist and Company Feedback subforum in the Marketplace! 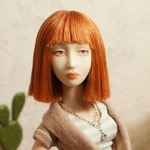 You may use this subforum to start and add to threads describing the quality of service and products from porcelain doll artists. You may also post threads for porcelain doll accessories or furniture if it is relevant to porcelain bjds (for instance, if it was bought for a porcelain bjd). Like the Discussion by Artist subforum, the Company Feedback will be structured to keep reviews clear and easy to find. There will be one thread per artist/company and one artist/company per thread. Please use the review form posted here. No chat may be posted in the Company Feedback forum, only reviews from people that have bought a product. If you wish to chat, please turn to the Discussion by Artist or Chat forums. We hope that this will be useful both for potential customers and for artists trying to improve their service and products. Thank you!